Expert freelance PR for all your best authors! Backed by 9 Years of experience and a great rapport with the media! Long and short-term campaigns available! E-MAIL NOW for more info! SandyPR will provide PR campaigns focusing on radio from the grassroots level up to the nationally syndicated and network programs. Sandy focuses on maximizing a client's exposure through talk radio and broadcast media and works hard to keep the client's itinerary moving along at a pace that suits the client's schedule. SandyPR's services are priced very competitively. We've got something for everyone! SandyPR, like her freelance colleagues, handles the overflow for publishers' publicity departments. "The growth of a freelance publicity industry is usually a sign that other houses are becoming too strained to handle their own promotion... [and] highlights how publicists at some larger publishers may not have the resources--or the experience--to handle" some of their titles. 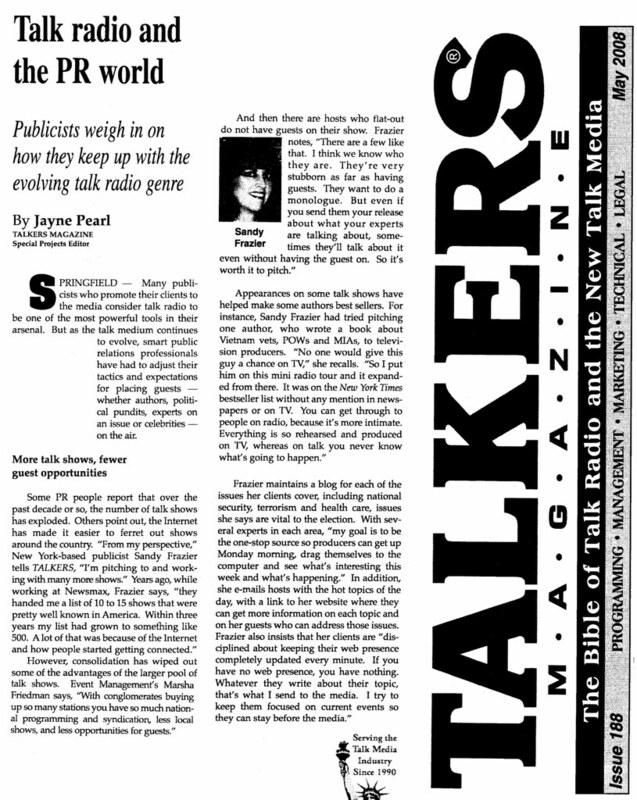 Read Sandy's Talkers Magazine interview. Grab a feed of the SandyPR.com blog now!